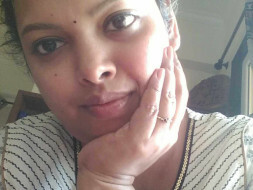 This is an appeal to humanity to save a precious bright life -Debjani Basu, an assistant Biology teacher fighting a relapsed lymphatic cancer & been under treatment in Tata Medical Centre, Mumbai. She is a mother of twins , with ZERO financial support from her in laws', her parental condition too is very poor & she had exhausted all her savings already for this prolonged desease which has been detected 3 years' back. 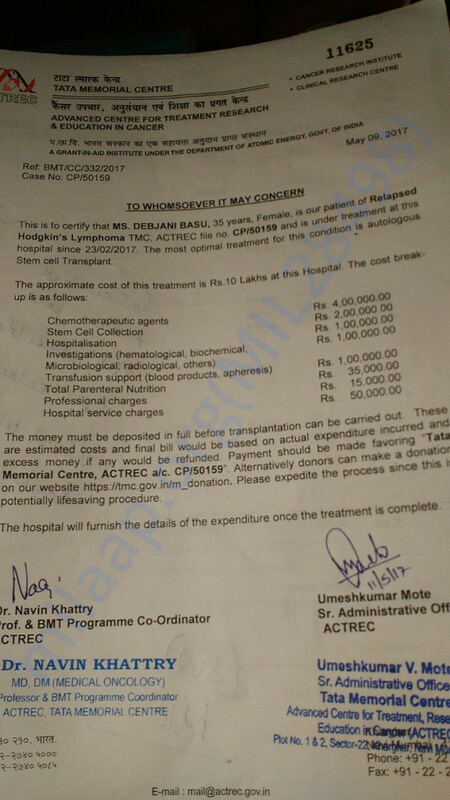 She has been advised for an early bone Marrow Transplant with immediate hospitalization at Tata Medical Centre. She is the sole bread earner for her family & she is wholly responsible for the upbringing of her 2 children. A penny help might save a LIFE! An appeal again, to you all to save DEBJANI. I'd like to take this platform to make this vital announcement that the amount raised through Milaap needs to be withdrawn & transferred to Debjani's respective account . Debjani has been advised to be hospitalized by early or mid next week as she needs to undergo the most crucial phase of the treatment -BMT. She's been under constant medical supervision & undergoing multiple blood & routine health check ups at Tata Medical Mumbai. As a part of the process, she needs to be extra careful & cautious to take well care of her general health as any minute infection can play havoc to her health. Even her health check up includes some dental procedures including tooth extraction. Her hospitalization estimates about a month and a half stay minimum with very frequent & rigorous health check-ups to be continued for a minimum 6 -8 months of post-BMT follow-up. Her vitals are good by Almighty's grace and your support and blessings as of now. Last but not the least, on behalf of Debjani Basu, I Saranya Ghosh, thanking each & every noble soul who had not thought twice & very kind enough to stand by Debjani Basu, while fighting one of the hardest battles what she is fighting against. Your response, support, contribution & prayer had helped Debjani to stand here today to take a bold step. We wish, your prayer & good wishes will continue throughout to be with Debjani to overcome this ordeal too. I would like to assure you that each & every bit of this penny shall only & only be spent on this expensive treatment & nothing else. It's a privilege to share this platform with you each & all who are instrumental & the very reason for this successful campaign. Debjani is currently undergoing all her routine medical check-ups, this funding has doubled up her confidence & moral upliftment. Once all her checkup results are good to go, she would be admitted in Tata Medical, Mumbai for Bone Marrow Transplant. So far she has been responding well to the treatment. Please pray for her health and speedy recovery.